While our development is mostly focused on the expansion there are a couple of issues that we wanted to address before its release as we think that they will greatly influence the experience of playing the DLC as well as the base game. First of these is the global map. This was a contested issue since the alpha versions and is probably the most frequent complaint we get from the people that have a positive view of the game as a whole. Some people may be wondering if the global map was something that was originally planned for the game and, truth to be told, I don't really remember (original plans for the game were laid almost 10 years ago now), but knowing myself I would probably implement one if I had the (time) resources that I have now. Back when I was at it alone I had to cut corners in both content and feature departments, and map is a bit of both really. Later, when the game has grown monstrously in size, even though I then had the time to add new features, a good amount of geographical inconsistencies made sure that there was no quick and easy way to produce a quality map, but instead some major rearragements were going to have to be made. But anyway, now that we got around to doing this, here's how the map implementation looks like (new players be careful, there are minor spoilers). Core City and Institute will not be included, at least not initially, because reasons. We are, also, not going to be making any maps for "dungeon" areas and such (like GMS) unless they are part of geography of existing maps (such as Depot A being part of Lower Caves by being an extension of Junkyard). As you can see on the screenshots, maps will (usually, but not always) record and display what useful (or not so useful) creatures and plants you've encountered there as well as other points of interest (merchants, doctors, certain quest objects). These will not be updated after the initial encounter and do not always represent the actual state of the map, but are rather meant to be used as useful auto-notes for harvesting organs and plants and such. They will typically not record robotic and human enemies. You can also add your own notes to the map. 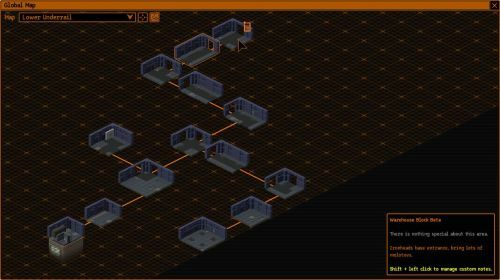 A lot of static features of the map will also reveal themselves as you explore the map so that you won't automatically know, for example, if there's a power generator on that map immediately after entering. The map will be available in the next updated which will be released sometime before the DLC which is going to be released when it's ready. But on a serious note, I do hope to release a new update on the experimental branch at least in the near future so you guys can play with all the new stuff that we've added over the months and we can finally get this huge pile of patch notes off of our shoulders (and replace them with bug reports). Anyway, let us know what you think about the inclusion of the global map and about this particular implementation. In the next dev log I'll probably be talking about another important, but probably less impressive, change to the base game that we're working on. Looks very cool, as always. Any guesses what that other feature might be?